In 2016, Colombia’s government reached an historic, but highly controversial peace agreement with the Revolutionary Armed Forces of Colombia (FARC) paramilitary group, after more than 50 years of violent conflict. In April of this year, in a highly controversial official part of the peace plan, Colombia’s Congress approved FARC as a political party, granting them 10 seats in Congress. This component of the deal has sparked outrage amongst many seeking greater punishment for FARC’s crimes. Many Colombians fear the prospect of a former militant group known for kidnappings and other illicit activities attaining legitimate political power, all at a peaceful, but fragile time for Colombia. Despite Colombia’s history o violence and corruption, the country has succeeded with peaceful democratic transitions of power. It also has stewarded a healthy economy, with GDP growth averaging 4% annually from 2000 to 2015 and healthy inflation at around 3%. However, the country currently runs a fiscal deficit and the peace plan calls for ambitious workforce reintegration and rural development programs for former FARC soldiers. The cost of these efforts over the next decade is estimated at a daunting $45 billion. Consequently, Colombia faces conflicting priorities and agendas. FARC faces a major learning curve as a political party accustomed to violent resistance, now expected to contribute to peaceful governing. It also faces an upward battle for approval since many voters remain angered at its past crimes and skeptical of its intentions. However, the peace agreement grants the opportunity for FARC to gain more seats in Congress in 2018 and 2022. Colombia will elect a new president in May 2018. A strong anti-establishment attitude toward the current centrist president, Juan Manuel Santos, means a number of outcomes may result, which could a) inadvertently strengthen FARC’s influence, b) threaten a return to militancy, or c) allow FARC to create gridlock. None of these scenarios appear ideal for a country trying to move forward. President Santos won the Nobel Peace Prize for his efforts, but only around half of Colombians support the peace agreement and about a quarter of Colombians approve of his performance. He is ineligible for a third term and his center-right party, the Social Party of National Unity, which built a strong moderate coalition in Congress, has frayed. These circumstances indicate a desire for change and inclination by voters for a more populist platform. Consequently, a wide-open presidential race with 53 candidates has been created. A win by either side could strengthen or antagonize FARC and its far-left platform. The presidential race currently has three major progressive contenders: Humberto de la Calle, Juan Manuel Galan, and Gustavo Petro. Each has stated his commitment to the peace agreement. Under this scenario, FARC as a political party should stay relatively quiet, considering that a left-wing administration will most likely follow through with heavy spending on rural development and workforce reintegration programs. 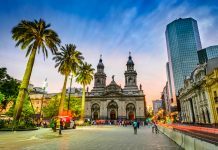 However, a leftist administration may not implement the critical fiscal reforms many outside observers deem necessary to maintain Colombia’s credit rating and foreign direct investment. Meaning in the longer-term, Colombia could fail to sustain rural economic development, ultimately threatening FARC’s faith in the government and willingness to compromise. Former President Alvaro Uribe vehemently opposed the peace deal and led a public campaign to resist its implementation. The right-wing presidential candidate, Ivan Duque, of the Centro Democratico party, is widely seen as Uribe’s chosen candidate. 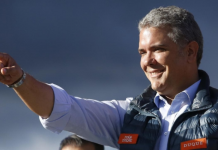 Duque would unlikely terminate the peace deal, but politicians on the right have stated their intent to alter components of the deal such as amnesty for FARC soldiers involved in drug trafficking. These actions, combined with the likelihood that a right-wing administration will prioritize fiscal reforms, may antagonize FARC and play into their socioeconomic grievances, giving them a bigger microphone. Under either scenario, many Colombians will continue to aggressively oppose FARC’s new rights as many feel that more ex-FARC soldiers should be prosecuted for their crimes. If ex-FARC soldiers are systematically murdered or attacked this could create renewed violent conflict, but also could give FARC a platform to blame this on government incompetence or claim collusion. Additionally, under any administration, reintegration programs could continue to move slowly, leaving many ex-FARC unemployed. Lucrative black market activities remain in the rural areas they have now vacated. If programs appear insufficient or disorganized, FARC soldiers could return to activities familiar to them. Colombia is one of seven countries in Latin America that will elect a new president during the next 12 months. At a time where much of the region has shifted to a center-right government, widespread frustration with corruption and slow economic growth has sparked a re emergence of populism. Neighboring Venezuela will remain socialist for the foreseeable future. If major powers such as Colombia, Mexico, and Brazil also shift left this could make FARC’s agenda slightly less radical. Even if Latin America does not shift left, the massive turnover of leadership creates the potential for political polarization. Additionally, the average voter turnout rates vary greatly. 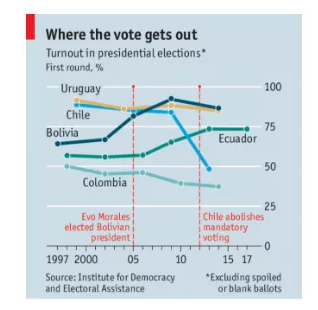 South American countries had an average turnout in the mid-70s, but Colombia now averages only 43%. Considering the crossroads at which Colombia finds itself, this number should be concerning. If FARC leaders succeed at generating even 5-10% more support than anticipated, this could create just enough influence by FARC in Colombia’s congress to stall the progress of critical policies. 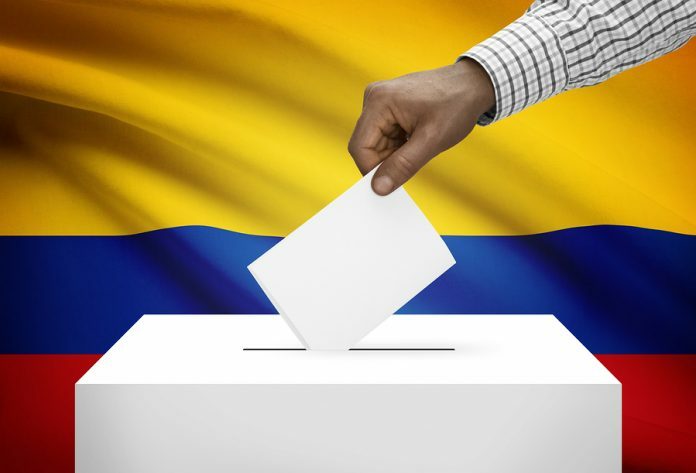 Domestic and international stakeholders seeking guidance on how FARC’s arrival as a political party will affect Colombia as a market and political allies should watch closely for voter turnout levels, the margin of victory for the next president, and his success in building a governing coalition to stave off gridlock. The wave of elections in Latin America in 2018 could shift regional alliances, including trade deals. How the Colombian Congress balances granting legitimacy to FARC, while also containing its ability to create chaos, will be an important factor in Colombia’s growth or stagnation. Next articleThe Turkish Lira Continues To Slide, Are Bonds Next? 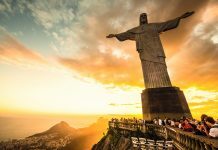 How Market-Friendly Are Brazil’s 6 Presidential Candidates?